The drake Wood Duck is considered one of the most beautiful species of waterfowl in North America. In 1918 this bird was near extinction due to habitat loss and hunting. Fortunately, wildlife management has protected this species to the point that it is one of the most common ducks in the Eastern United States today. In spring you can find several nesting cams of these birds on the internet. Check back as we sometimes have a friend who allows us to stream live from his nestbox cam. 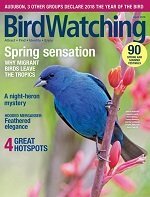 You can learn a lot about these birds during that time. The Wood Duck is 18 inches in length. The male has a colorful head with a white throat and a partial neck-ring and chinstrap. The large crest is green and the bill is multi colored. The eye is noticiably orange/red. The female is brownish gray with a darker crown and a broad white eye-ring that tapers to a point in back. Males plumage in winter is similar to female but retains some of the white facial markings. 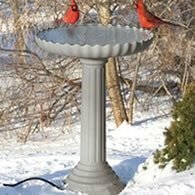 The mating/courtship habits of these birds take place through fall and winter on their wintering grounds. The pairing up begins well before the actual breeding season. Throughout the winter the male will spend his time trying to protect the female. The pair are early migrants to their breeding territories often returning right after the spring thaw. The courtship of the female is a repeated flick of her bill back over her shoulder to which the male will respond by by raising his wings and tail, turning the back of his head to her so that she can see the bright white feathers as he swims away. If she is impressed she will begin to follow him. The choice of mate in completely the females. Females will remember where they hatched and will bring the male to that same cavity. If the cavity is being used she will find another cavity close by. The females nest is made of wood chips and down. Located in a natural tree cavity or man-made birdhouse. The nest is generally 5 to 50 feet above the ground or water. If successful broods are raised, these birds will often return to the same nest year after year to raise successive broods. The female bird lays 10 - 15 dull white eggs. One egg per day. During egg laying the male will accompany the female to the nest site each day. Once incubation begins, the males involvment diminishes to being absent by hatching time. Inucbation is done by the female and last 27 to 30 days. Upon hatching and seeing their mother, the young are immediately imprinted. The day after hatching, (within 24 hours) the female will leave the nest and begin calling the young. One by one they will climb to the opening and drop to the ground or water and head toward their mother. The female Wood Duck will take the young to water where they instinctivly know what to eat. At evening time, the female will find shelter for her and the young for the night. The young birds will need about 7 more weeks before learning to fly. During this time they follow and obey their mother for safety and finding food. The first weeks the young need protien and feed on crusteaceans, small fish, insects and their larvae. As they grow, they'll eat aquatic plants, nuts, and fruit. Some of the plants they eat are; duck-weed, and wild rice. When females begin incubation, the male Wood Duck abandons the female and the egg clutch while forming flocks with other males. By mid-summer the molting process begins for the male. The male loses his flight feathers all at the same time. This means they cannot fly and are at high risk of predation. During this time they move into remote places that are full of tall reeds, where they can hide. This molting process takes up to four weeks. The male will have a more drab apperance and look similar to the female. At the base of their tails Wood Ducks have a gland that secrets a wax substance that they rub on their feathers to provide water protection. By early Autumn, the young ducklings will begin to put on their adult plumages. Following landmarks, magnetic fields, and the sun, the ducks migrate to the southern states for the winter. Because they don't store fat, it's important that they find food sources along the way. While they are powerful fliers, they use a lot of energy flying. 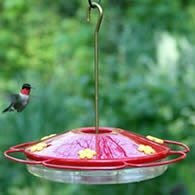 Their build and short wings mean they must flap their wings fast to stay aloft. They do not glide like most larger birds. 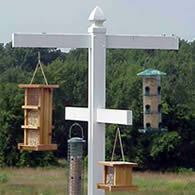 Predators of these birds include; foxes, hawks, cats, large mouth bass, and turtles. Nearly 90 percent die in their first few weeks. 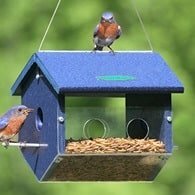 You can do your part by providing birdhouses birdhouses for them if you live close to ponds, lakes, wetlands and other like habitats.